Map of the Dorothea Dix Park Master Plan. 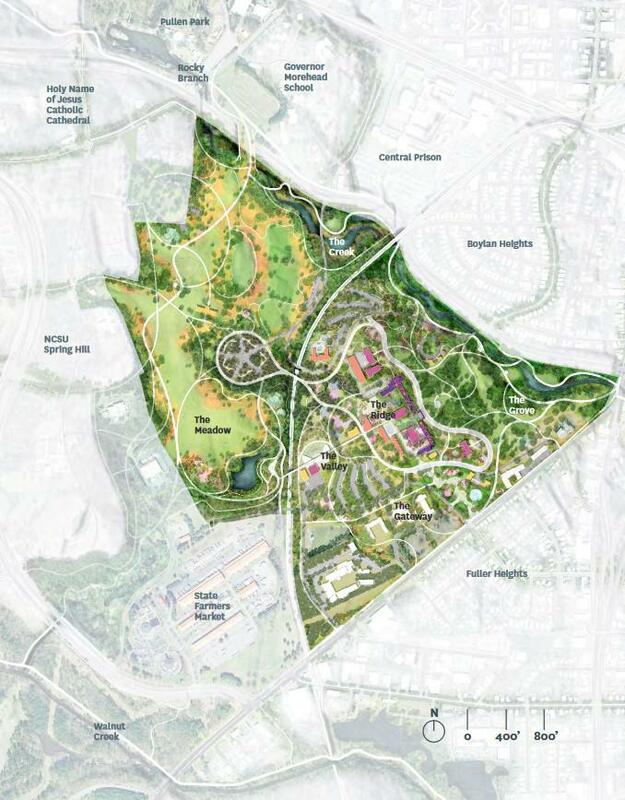 The public last night got to see Raleigh's master plan for Dorothea Dix Park, the 308-acre site of a former state psychiatric hospital. The capital city purchased the property in 2015 and hired the Michael Van Valkenburgh architectural firm. The resulting plan would transform the grounds into a sprawling city park featuring playgrounds, trails and gardens. The park will be developed over four phases that could take years to complete. Phase I covers 120 acres and includes two of the park's six envisioned landscapes. One is called The Creek and involves restoration of a natural area--The Gateway will feature plazas and play areas. A later phase will include construction of a performance venue called the Valley Theater--meant as an alternative to the Red Hat Amphitheater, which is not deemed to be a permanent facility.